Rabbi Naftali Brawer explores The Talmud, the ancient book of Judaism. Rabbi Naftali Brawer delves into one of the greatest books ever written holding the key to unlocking Jewish thinking and history. 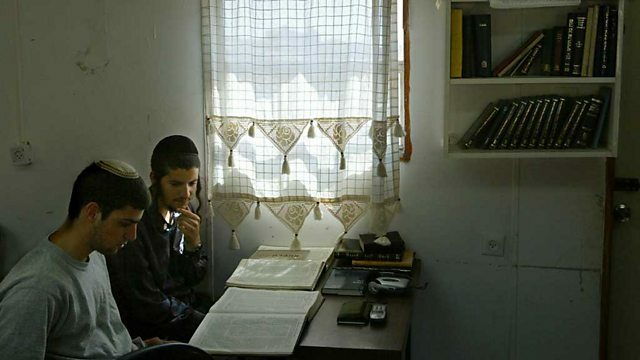 Travelling to Jerusalem, he gains rare access to one of the world's leading ultra-orthodox yeshivas - the Mir. Here he finds young men who will study these ancient Hebrew and Aramaic texts, full time, for anything up to 30 or 40 years. They explain how arguing and debate are the way to understand the ancient wisdom of the rabbis who have contributed to the Talmud though the ages - and still tell you everything you need to know about how to be a Jew today. The Talmud is not about the arrival, but the journey and it's less about about finding answers than discovering what the questions are. Tracing the history of the Talmud, Rabbi Naftali heads to the Galilee to the archaeological site of Beit She'arim, the remains of an ancient city, where shortly after the destruction of the 2nd Temple, the first words of this book were written. He discovers that the Talmud was an audacious project defying one of the key Jewish laws which forbade writing down the Oral Laws of Moses. Its creation was deemed necessary in order to preserve Jewish culture and practice which, at that time, was facing extinction. Rabbi Naftali meets some of the greatest Jewish minds and scholars in the world today: Rabbi Adin Steinsaltz, described by Time Magazine as a 'one in a millennium scholar', who has published his own edition of the Talmud; Gila Fine - one of the growing number of female orthodox academics working with the Talmud. The programme ends with a moving story from leading Talmudic scholar and holocaust survivor, David Weiss Halivni, who explains how the Talmud sustained him in the concentration camps.